This excursion to the island of Capri is a soft relaxing day enjoying the gifts of Nature and the beauty that man has created out of it. The meeting with the guide takes place down at the harbour of Sorrento (or Naples) or by Your hotel. After an introduction and a briefing, clients are taken to the jetfoil either the hydrofoil or the catamaran, that arrives on the island 20-25 minutes later (from Sorrento) or 45-50 minutes from Naples. Once there, You’ll have a private boat with the sailor for a great ride around the Island, starting from the port. Along the way the boat will approach several caves (the small blue grotto, the white cave, the coral cave, the green cave, etc), but not the Blue Grotto (it’s possible to organize this visit, but it’s not included in this tour) . Once back to the port, You’ll take a convertible taxi for driving along the most “panoramic road in Italy” as far as Anacapri. Up there You’ll have another great experience: the chairlift to the highest spot of the island. 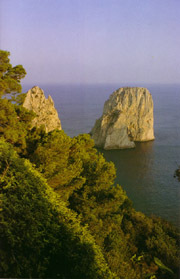 Free time for shopping and a snack, then a taxi will take You to Capri town, the other village of the island. That area is totally pedestrian and with Your guide You’ll walk to the Gardens of Augustus and then other free time for exploring that village on Your own. For getting down to the port, You’ll take the cable-car and the guide will take You back to Sorrento (or Naples) by jetfoil (or catamaran). The guide will leave You at the harbour or by Your hotel.